December 11, 2017 at 11:56 am. The Yankees also received cash considerations from the Marlins in exchange for second baseman Starlin Castro, minor league right-hander Jorge Guzman and minor league infielder Jose Devers. 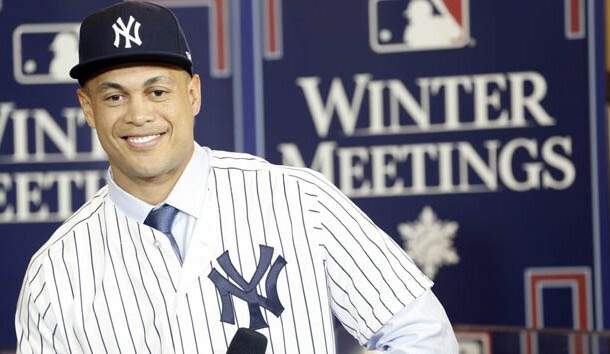 The two teams reached terms of the deal on Saturday pending final approval from the 28-year-old Stanton under the terms of his no-trade clause and passing a physical. Stanton, who hit 59 home runs for the Marlins this past season, is now in pinstripes and will be joining another slugger in the Yankees outfield — American League Rookie of the Year Aaron Judge, who hit 52 homers in 2017. The Yankees led the majors with 241 home runs in 2017. The towering duo of 6-foot-6, 245-pound Stanton and 6-7, 282-pound Judge will be in the 2018 Yankees’ lineup for new manager Aaron Boone. Only once in major league history has a lineup boasted two 50-homer players — the 1961 Yankees when Roger Maris broke Babe Ruth’s record with 61 while Mickey Mantle hit 54. Talks between the Yankees and Marlins picked up Friday after Stanton turned down deals with the St. Louis Cardinals and San Francisco Giants. The Cardinals and Giants both targeted Stanton from the time that new Marlins ownership — led by former Yankees great Derek Jeter — made it known they wanted to move Stanton to help slash payroll. He is owed $295 million over the next 10 years with an opt-out clause in 2021. The Yankees will be responsible for $265 million with the Marlins kicking in $30 million as part of the deal, according to multiple reports. Stanton has the right to opt out of his contract and become a free agent after receiving $77 million over the next three season, ESPN reported. Stanton led the majors in home runs, runs batted in (132) and slugging percentage (.631), while batting .281 with 123 runs scored, 32 doubles, 85 walks and a .376 on-base percentage in 159 games. Stanton also collected his second career NL Hank Aaron Award as his league’s most outstanding offensive performer (also 2014) in addition to earning his second Silver Slugger Award (also 2014) and making his fourth All-Star team (2012, 2014-15, 2017). Since the start of his career in 2010, Stanton’s average of one home run per 13.40 at-bats is the best in the majors among those with at least 1,000 plate appearances over the span. In his eight seasons with the Marlins, Stanton is a .268 hitter with 267 homers and 672 RBIs. This trade marks the second time in major league history that a reigning MVP has been acquired via trade prior to the start of the following season. On February 16, 2004, the Yankees acquired reigning AL MVP Alex Rodriguez from the Texas Rangers. Castro, 27, batted .300 with 66 runs, 18 doubles, one triple, 16 home runs, 63 RBIs, 23 walks and a .338 on-base percentage in 112 games with the Yankees in 2017. He was also named to his first American League All-Star team, marking his fourth All-Star selection overall (also 2011-12, 2014 with the Chicago Cubs). Acquired by the Yankees on Dec. 8, 2015, from the Cubs, Castro played two seasons with the Yankees, posting a .283 batting average with 129 runs, 47 doubles, two triples, 37 home runs, 133 RBIs and 47 walks in 263 games. Signed by the Cubs as a non-drafted free agent in 2006, Castro has hit .282 with 99 home runs and 496 RBIs over 1,154 career games. Guzman, 21, went 5-3 with a 2.30 ERA over 66 2/3 innings in 13 games (all starts) with short-season Class A Staten Island in 2017. The right-hander was originally acquired by the Yankees from the Houston Astros on Nov. 17, 2016. Over three minor league seasons, Guzman has an 11-11 record with a 3.67 ERA over 162 innings in 43 appearances (33 starts). Devers, 18, was originally signed by the Yankees as a non-drafted free agent on July 2, 2016. A native of Samana, Dominican Republic, the left-handed hitting shortstop made his professional debut in 2017, batting .245 with one home run and 16 RBIs in 53 combined games in the minors.